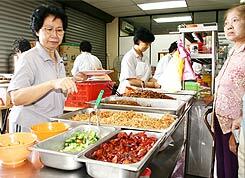 The Than Hsiang Vegetarian Canteen opens daily from 8.00am to 8.00pm every day of the week. 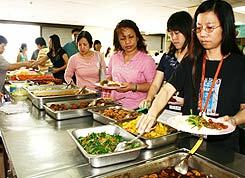 • A special Lunch counter of economy rice with four types of vegetarian dishes and Dinner of rice with eight types of dishes on a self service and “Donate as You Wish” basis. This is Than Hsiang's way of promoting vegetarianism among the community. • Soup of the day and cold drinks are free as accompaniments to the above meals. • Daily take away and delivery of Lunch boxes. 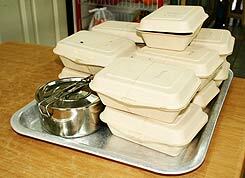 Orders for delivery of Lunch boxes have to be made in advance and include delivery fees. Please call 04-641 5523 for further details. • Home delivery food catering. 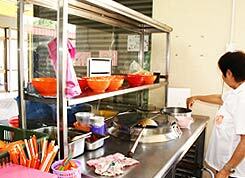 We also provide door to door food catering for lunch only. For details, please call: 04-641 5523. 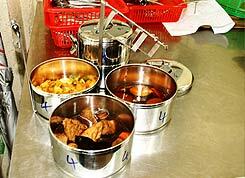 • A set of rice with three or six vegetarian dishes and Chinese tea is available for prayers at Da Yuen Dian. • A great variety of local hawker style noodles such as Laksa, Curry Mee, Hokkien Mee, Jawa Mee, Lam Mee, Law Mee, Char Hor Fun and nyonya kueh is made available on the 1 st and 15 th day of each lunar month as well as on the Birthday of Bodhisattva Avalokitesvara (Guan Shi Yin) and during the Nine Day Vegetarian Festival in October.